Republican presidential candidate Mike Huckabee said his joke suggesting his opponents consider slitting their wrists because their support doesn't match their fundraising wasn't an attempt to make light of suicide, though he did not apologize for the remark. "I would never intentionally hurt the feelings of anyone for any reason, and I certainly was not making light of suicide, but of the excesses of campaign spending," Huckabee said Wednesday in a statement issued by his campaign. In a television interview Tuesday, Huckabee joked that better-financed candidates could be "sitting in a warm tub of water with razor blades." Suicide-prevention counselors called the remark irresponsible. It was not the first time Huckabee has used the image of suicide to make a point. In 2002, asked for his plan to address a tight state budget after an economic downturn, Huckabee said, "Sitting in a warm tub of water with a lot of razor blades." Huckabee used a similar comment after the 2005 off-year elections when asked whether President Bush's low approval ratings hurt Republicans. "We did not win seats, but we didn't have those seats," Huckabee said. "But let me just say, as bad a day as it may have appeared to be, I don't hear any Republican who's sitting in a tub of warm water with a handful of razor blades ready to say it's all over." Facing criticism over his remarks, Huckabee - a southern Baptist minister - said he understands the seriousness of suicide. "During my years as a pastor, I counseled dozens of people who were confronted with suicide and I am well aware of the seriousness of the issue. Suicide has touched many families, including mine, and I would never do anything that would hurt others or add to their grief," Huckabee said. The American Foundation for Suicide Prevention criticized Huckabee's remarks in an open letter to the former Arkansas governor earlier Wednesday. "While we understand that these statements were meant to be humorous, they instead make light of suicide, and contribute to the myth that suicide is a rational choice rather than the fatal consequence of mental illness," wrote its executive director, Robert Gebbia. The National Hopeline Network, which runs the 1-800-SUICIDE help line, criticized Huckabee in a statement issued Tuesday night. Huckabee, who rarely speaks from prepared remarks, has repeatedly had to defend himself against slips of the tongue and jokes he made during his 10½ years as governor. When radio personality Don Imus interviewed Huckabee last year about his 110-pound weight loss after a diabetes diagnosis, the governor joked that he had spent time in a concentration camp. Huckabee dismissed a Jewish group's criticism, saying he hadn't made a reference to Jews or the Holocaust. Huckabee also angered state Democrats in 2000 when he joked that Arkansas was a "banana republic" and that Democrats would attempt to steal the presidential election from Republican George W. Bush. 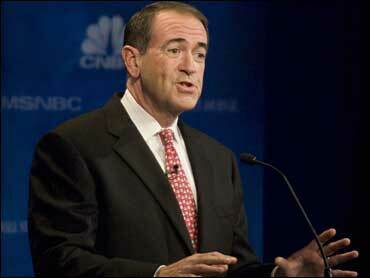 "I hate to think I'd have to live my life without a sense of humor," Huckabee said last year. This also isn't the first time Huckabee's "razor blades" line has drawn criticism. When Huckabee ran for re-election in 2002, his Democratic opponent, Jimmie Lou Fisher, criticized him for the comment. "I hope he was joking, but that's no answer for the problems we got," Fisher told the Arkansas Democrat-Gazette then. Fisher declined to comment on Huckabee's latest suicide remark. Rex Nelson, who served as Huckabee's communications director in the governor's office, said he didn't believe Huckabee's off-color comments drew the ire of average voters as much as it did his political opponents. "Mike Huckabee is a very upfront guy with a good sense of humor, and I think people understand that," said Nelson, now the alternate federal co-chairman of the Delta Regional Authority. "He's not programmed like so many people who run for office in that country. I always found it refreshing to listen to somebody who's not so programmed." Hendrix College political scientist Jay Barth said Huckabee's quips haven't hurt him in the state politically. The former governor enjoyed a 55 percent approval rating in his final months in office. Huckabee left office in January because of term limits. Despite meager fundraising, Huckabee has distinguished himself from his better-funded rivals through his debate performances and one-liners. He could lose some of that appeal if his comments come off as too edgy, Barth said. "He has differentiated himself as being an optimistic, positive candidate," Barth said. "This doesn't feel as positive as the demeanor that has really benefited him."